It can be very disturbing to women who do not know much about fibroids, predominantly when they start finding their lower abdomen gaining weight and they are not pregnant. Let what are fibroids not be your worry any longer. Fibroids are tissues that grow on the wall of the uterus. They are usually tissues that are on the wall of the uterus that grow as a result of estrogen that is released by the bodies of women who are of the child bearing age. The fibroids feed on estrogen and hence they grow and develop: they vary in size and in weight from one woman to the other. Some can be as small as a peanut and others develop to a very big size like a water melon. The fibroids are made of tissues of the uterine muscles and other kind of tissues that are threadlike called connective tissue. The fibroid is therefore made of intertwined tissues. Most of the fibroids are called tumors, but they are not cancerous but just benign growths. Their survival is determined by the level of the hormones in the body that they survive on. They rely on the hormones released by the body or on contraceptives that contain the hormones for growth. They are not very common in young girls and in women who have reached menopause because those ones do not produce estrogen that the fibroids survive on. The fibroids start to shrink after a woman reaches menopause because they no longer find anything to survive on. Fibroids are very common because statistical records show that three out of ten women do suffer from fibroids those who are above the age of thirty five years of age. At most times, they are most common in women who are between thirty years of age and fifty years of age. It is very rare for fibroids to be found in women who are in their twenties. The number of fibroids that one can have is varied. There are those who can be found with just one fibroid while others can have more than one. There are those who can have quite a large number like one hundred fibroid tumors. The sizes as well vary from one woman to the other. There are those who can have tumors that are as big as a water melon and consequently they do cause a lot of discomfort to them. There are many unpleasant fibroid effects on the body for example if you have fibroids, your lower abdomen will looks swollen as if one is pregnant. 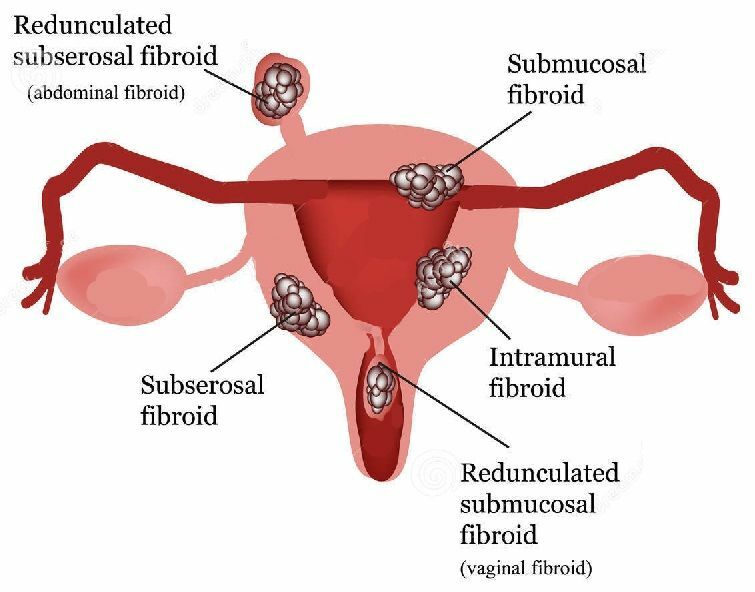 The fibroids have different names depending on where they are found in the uterus. There are those that are found on the inner side of the uterus and are called pedunculated fibroids. They hang in the inside part of the uterus having been attached by a thin cord. Others are found on the outer side of the uterus and are called Subserosal fibroids. They grow on the wall of the uterus but on the outside of it. There are others that grow in between the wall of the uterus and they are called intra mural fibroids. While there are only these few types of uterine fibroids, it is important to note that a women diagnosed with fibroids usually have more than one fibroid, and more than one type of fibroid. Causes Of Fibroids in Women – What Makes Fibroids Grow & How Can You Stop Fibroids From Growing? Women who have other estrogen-related disorders such as endometriosis or endometrial hyperplasia tend to suffer more from fibroids than women who don’t have these conditions. When I first started to research this information, it seemed to me like these chemicals were everywhere and were inescapable. My research confirmed that I was right. They are everywhere, and this is the reason why some women who are particularly sensitive to estrogens are experiencing rapid fibroid growth, other women are experiencing infertility, painful, heavy periods, endometriosis, breast or endometrial cancers. Switching from commercial, packaged foods to organic foods is one of the best things you can do for yourself. If you’re going to take herbal remedies or supplements, make sure they’re organic, wild-crafted or non-sprayed. Using natural cosmetics and cleaning products that don’t contain these harmful chemicals are going to be great for your body and the environement. Similarly, storing and heating your food in ceramic, glass, or stainless steel will stop xenoestrogens from leaching into your food. The majority of the chemical that causes fibroids are not biodegradable, which means they have already accumulated in your fatty tissues, and organs. Simply cutting out these chemicals will prevent your fibroids from getting worse, and will reduce your fibroids symptoms but won’t reverse or shrink fibroids. Estrogen is a hormone. It is produced by the ovaries, and responsible for the development of the female reproductive system during puberty. It also stimulates the growth of the muscles of the uterus, and the thickening of the endometrial lining. Hormones are essentially chemical messengers that travel from one organ to another, via the blood stream and instruct organs to perform specific actions at a cellular level. Hormones affect the organs that have receptor sides. Receptor sites are a group of cells that respond only to a specific hormone. The cell will have receptors attached to it – receptors are microscopic structures that take a specific shape or configuration that match only the chemical composition of the hormone. It works in a similar way to a key and a lock, if you imagine that hormones are keys, and receptors are locks. When the hormone connects with the receptor, this gives the cells and the tissues that the cells make up, specific instructions, e.g. estrogen can tell the endometrial lining to thicken, and unfortunately, it can also tell fibroids to grow. Phytoestrogens – which are estrogens that occur naturally in plants, and are used by herbalists to help women who are going through menopause, and to help to block the effects of more powerful estrogens in women with estrogen-dependent disorders. Mycoestrogens – estrogens that are produced by fungi. They mostly affect livestock and poultry, but you can find them growing on mouldy crops, such as rice, oats and wheat. Xenoestrogens are environmental estrogens, artificially created as a by-product to the chemical industry. In the past 10 years, there have been a lot of studies that have linked xenoestrogens to conditions such as fibroids, endometriosis, infertility, lowered sperm counts and cancer. They are found in pesticides, PCBs, plastics, the lacquer that lines the inside of cans used for storing food, and many common foods and household products. 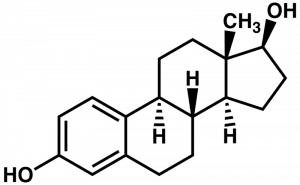 Xenoestrogens are recognised by estrogen receptors, but have a stronger effect on the cells than other types of estrogen. Some of the most deadly xenoestrogens are PCBs. PCBs were used in industry decades ago, but were banned in the 1970’s. Although these substances are no longer in use, they have accumulated in water, soil and in the fat of animals and humans. Scientists have even found the substances secreted in human breast milk! Because they’re a mix of synthetic chemicals, they’re not very biodegradable, this means it’s difficult for the environment, and human body to break them down. It can take hundreds of years for these substances to be broken down in the environment, and in our bodies as they are unnatural substances that nature does not have processes or tools to deal with. Researchers have linked uterine fibroids with xenoestrogens, which are estrogen mimickers – artificial chemicals that can fit into estrogen receptors. Contaminated water is a prime source of xenoestrogens, as lakes and rivers near chemical processing plants where waste products are dumped, have been noted to have an extraordinary effect on the wildlife that live in the water. Researchers at the Tulane University School of Medicine in New Orleans have linked estrogenic toxins in the environment to uterine diseases such as fibroids and endometriosis. They found that male fish, turtles and frogs in detergent-contaminated water started to develop female characteristics, such as ovaries, and decided to see whether the contaminated water affected mammals. The researchers found that polar bears exposed to the contaminated water gave birth to hermaphrodite offspring (this means they are neither male nor female), and female seals developed an excess number of uterine fibroids. When they started to research the effect of these chemicals on human females, the results were the same. Women exposed to estrogenic toxins tended to develop more fibroids and endometriosis than women who were not exposed to the substances. If you’re drinking this water, even if it’s been refined, or you eat plants or animals that have been farmed with this waster, then you are more likely to be affected by xenoestrogens. You’ll also find xenoestrogens in cosmetics, such as moisturisers, sunscreen lotions, make up, body creams, perfumes, deodorants, shampoos, toothpaste… just about anything. The things to look out for are parabens. All of these are parabens. Next, look at any medication you might be taking, or over the counter drugs to see if any of these chemicals are in the tables you might be taking. Household products, such as insecticides, paints, oils, weed killers, dyes, glues and adhesives will contain a high number of xenoestrogen chemicals. If your fibroids have suddenly become worse, you need to think about what you’ve been exposed to that have caused them to grow. Other environmental pollutants that can cause fibroids to grow include dioxins. Dioxins are a group of 75 related compounds and the most toxic of the dioxins is TCDD . TCDD (this is short for 2,3,7,9, Tetracholorodibenso-p-dioxin) and its another group of chemicals that pollute the environment. These dioxins come from industrial waste, and the byproducts from the chemical industry. This dioxin can mimic estrogen in the body (as it fits into the estrogen receptor sites) and even a minute amount of this chemical in the blood can suppress the immune system, increase the risk of developing cancer and increase the risk of birth defects in the developing fetus. 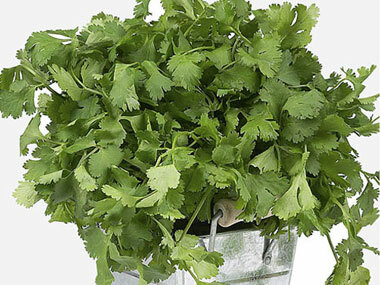 I am often asked which herbs I recommend for shrinking fibroids or what are some herbs to dissolve fibroids. This is quite a difficult question to answer, because there isn’t one “single” herb that can shrink a fibroid. That all depends on the size of your fibroids. Let’s be realistic here – if you were to go to your doctor, he would either suggest surgery (or worse – a hysterectomy) or a drug that has really nasty side effects, and could prevent you from conceiving. Herbal remedies are a gentle alternative to drugs or surgery, and because they are gentle, you cannot expect them to get rid of your problems in 30 days. I’m always surprised when I hear from someone who expects a herbal remedy to clear out in 30 days, the fibroids that have been accumulating in her body for over 10 years. What if my fibroids are huge? Okay, if people are asking you when your baby’s due, and you’re not even pregnant, then it’s time to take some drastic action. You can start by cleansing your body of all those accumulated toxins that have causesd your fibroids to grow out of control in the first place. To get rid of these substances, I recommend an Organic Body Cleansing Kit, which lasts 28 days, and contains enough for 2 cleanses. You will also need a food-based supplement to supply your body with the energy to fight fibroids, as well as the nutrients to rebuild the tissues of your reproductive organs. It will be very beneficial for you if you have suffered heavy bleeding or anemia because of your Fibroids. The food-based supplement I recommend is AlkaGreens Plus, which you can mix in your juice every morning, or sprinkle on soups or salads. It’s 100% organic, super low in calories, yet provides you with a massive surge in energy. If you have fibroid blocking your tubes, disrupting successful implatation, or causing miscarriages, the Fibroid Shrinking Kit will be ideal for you as well. I would advise you to focus on shrinking your fibroids first. You’ll find that once your fibroids are a manageable size, pregnancy will soon follow. What if I am already pregnant or nursing? I would recommend AlkaGreens Plus instead of herbs, because it has a very gentle detoxification action, and provides you and the baby with the nutrients to stay healthy.